"My congratulations to her!" said Chinese sci-fi author Liu Cixin Sunday morning during an event at the Shanghai Book Fair (SBF) after a member of the audience told him that Chinese writer Hao Jingfang won the Hugo Award for Best Novelette with her Folding Beijing. In Hao's work, a futuristic Beijing is divided into three spaces occupied by three different social classes, with each layer separated from each other by both time and space. The story revolves around a father from the underprivileged class who adventures through the three spaces in order to earn money to pay for his daughter's education. The award-winning novelette was translated by Chinese-American sci-fi author and translator Ken Liu, the same translator for Liu Cixin's first novel in The Three-body Problem trilogy, which last year allowed the Shanxi-born writer to become the first Hugo Award winner who doesn't write in English. "Folding Beijing is very well written, and is very different from what she had written before," Liu Cixin told chinanews.com, noting that Hao's previous works often featured elegant and graceful narration and were usually related to economics due to her PhD in that field. Not long after Hao caused the world to focus its attention once again on Chinese sci-fi literature, Liu Cixin announced at his second SBF event that same day that the English version of Death's End, the last installment in the The Three-Body Problem trilogy, would be published on September 20 by Tor Books. The book sees Ken Liu return to the series as translator. The first two books in the English version of the trilogy were published in November 2014 and August 2015. As of the end of June they have sold more than 160,000 copies around the world. Its readers include big names such as Mark Zuckerberg and US President Barack Obama. Hundreds of fans attended the event, holding copies from both the Chinese and English versions of The Three-body Problem trilogy for Liu to autograph. One Chinese reader told the Global Times that while he doesn't read English he would be more than happy to spend about 500 yuan ($75) to purchase the hardcover English trilogy for his collection. For comparison's sake, the paperback version of the original Chinese series published by the Chongqing Publishing House costs about 80 yuan in total. Yao Haijun - editor in chief of Science Fiction World magazine, currently the only sci-fi magazine in China - was also in attendance at the events. 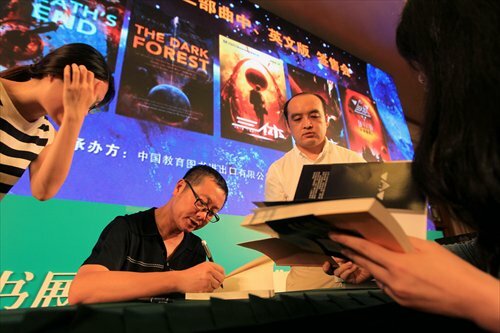 "It's fair to say that Liu Cixin has changed the way China and the English-speaking world communicate in the field of sci-fi literature," Yao said. "Before him, communication was pretty much one-way and Chinese readers were no less familiar than their US peers with US sci-fi works. Liu, however, has been able to make English-speaking countries begin to see the charm of Chinese sci-fi." Liu told chinanew.com that he sees Chinese sci-fi writers gaining more popularity worldwide is a natural trend. "Sci-fi originated in Europe, and later on with the rise of the US, its center transferred there. Now China is growing really fast and Chinese culture is becoming more significant worldwide, and our sci-fi literature, as a 'barometer' of social development, has caught the eye of Westerners," Liu said. Like Hao Jingfang who was born in 1984, a number of young sci-fi writers have entered into public awareness in China over the past few years. Chinese sci-fi writer Han Song, whose novel 2066: Red Star Over America predicted the rise of terrorism, economic crisis and racial strife in the US, said that Chinese sci-fi writers have more freedom when it comes to subject matter. "I finished 2066: Red Star over America in 1999, but it wasn't until 2000 that I found someone who dared to publish it," said Han. "But now Liu Cixin can depict the end of humanity in his Three-body Problem trilogy. You can see the difference." While sci-fi is one of the genres that embraces freedom the most in China, the number of Chinese sci-fi writers is still relatively small. According to Liu, there are currently only about 20 to 30 sci-fi authors in China. In regards to the future of China's sci-fi industry which covers everything from literature to cartoons, film and video games, both Liu and Yao said that it will take time for it to mature. "Sci-fi in China has been around for more than 100 years, but its development has been an off-and-on process," Yao explained. The beginning of original Chinese sci-fi literature is believed to have begun with a novel published in 1904 titled Lunar Colony. Liu also said that he feels the development of sci-fi culture will need support from multiple mediums, especially the film industry as he thinks visual mediums are the best way to present sci-fi subjects. A film adaptation of The Three-body Problem, produced by China's Yoozoo Pictures, was scheduled to release in July but was postponed to next year due to post-production problems. Liu refused to comment on the film on Sunday. "Of course Chinese sci-fi creators will come across many problems, but these are just growing pains," Yao added.